This was my first station from 1963 to 1964. 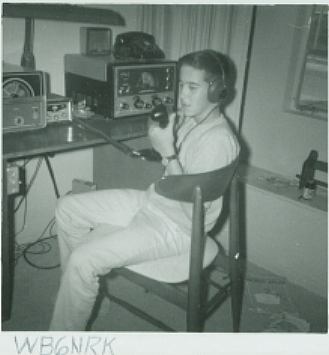 My first call was WN6IWX. My station was all Hallicrafters. The transmitter was an HT-40 and an SX-115 receiver. 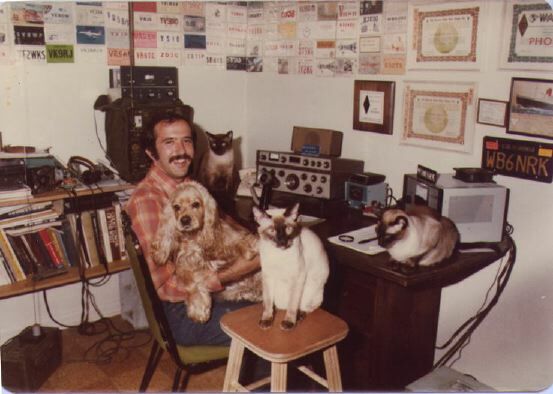 My dad worked for Hallicrafters in Santa Ana, California but he was not a ham. He called hams members of the "nitwit network" however he did encourage me into getting a license. 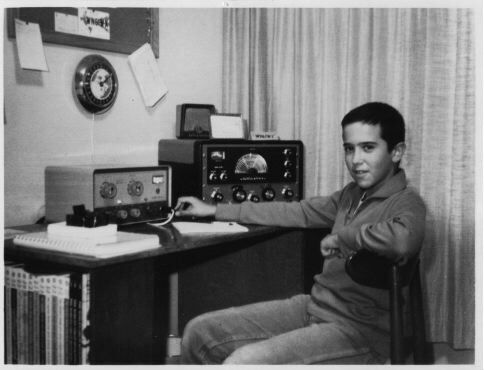 I met my elmer W6BAM (SK) in the summer of 1963 and he taught me the code and gave me the novice test. He had been a CW instructor in the Signal Corps during W.W.II and had been a ham since 1926. 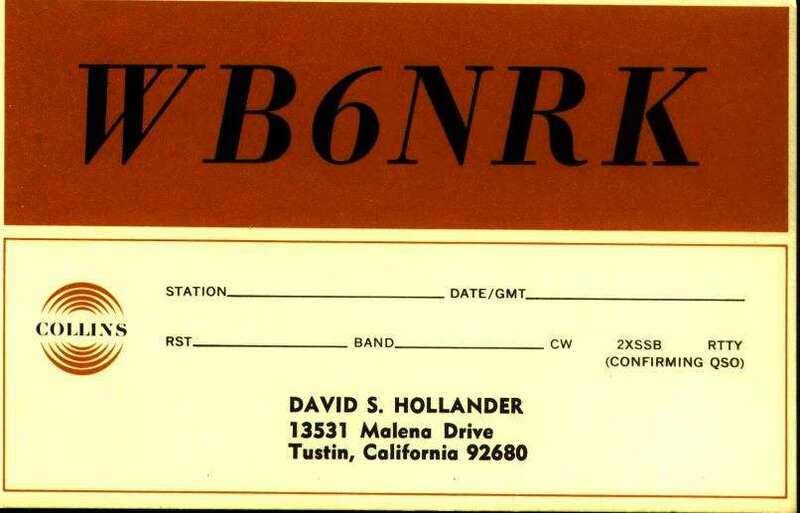 My first license expired at the end of 1964 and I became WB6NRK 2 months after that. 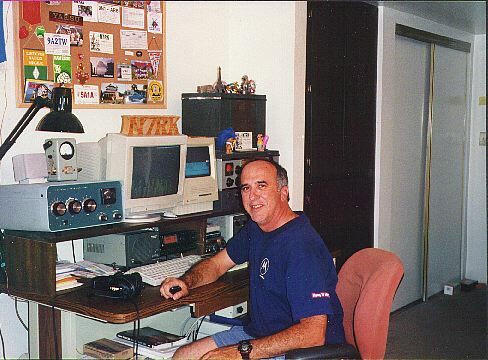 This photo was in the October 1995 edition of Electric Radio and is also in the QCWA on-line museum. This was my station in late 1965. The Hallicrafters HT-40 gave way to a Hallicrafters HT-37 and got me on sideband. I was still using the Hallicrafters SX-115 for my receiver. You can also see a Gonset phone patch. The antenna was a Hy Gain 18HT Hi-Tower which is still being made in 2007. My interest was DXing and I worked DXCC - 100 countries in my first 12 months as a General with this setup. This was the station in late 1966. The Hallicrafters HT-37 gave way to a Swan 350. I was still using the Hallicrafters SX-115 for my receiver. The box in the middle of the desk is the homebrew 75 watt novice transmitter built and used by my dad who had just become WN6UDC. I still have this transmitter The antenna was a Hy Gain 18HT Hi-Tower and we also had put up a TA-33jr on a TV mast on the roof of the house. This is WB6NRK around 1968. My dad worked for Collins Radio at this time and decided to get a license the year before. 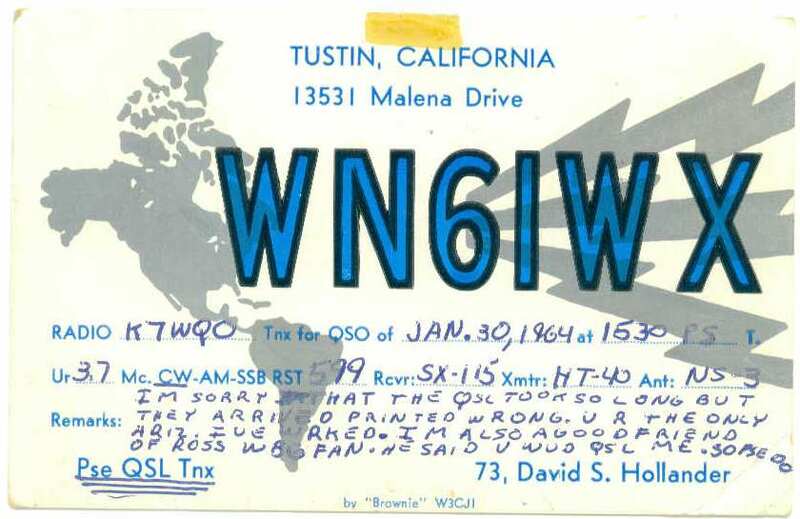 He was WB6UDC and is now N6UC. I had been licensed for 3 years longer than him. The rig was a KWM-2A, a 75S-3C and a Henry 2K. 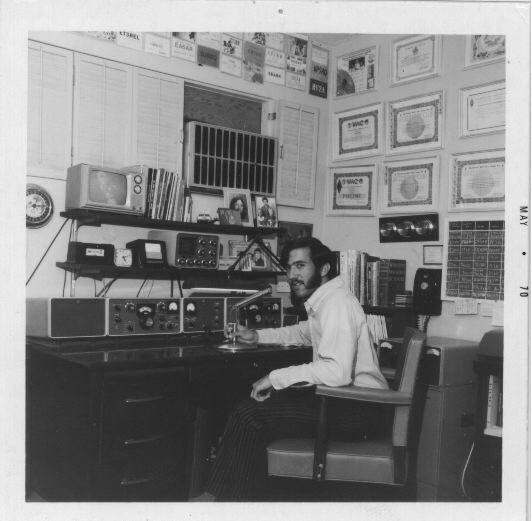 My dad worked for Collins Radio in Burbank and Newport Beach, California from 1957 to 1962 and than Hallicrafters in Santa Ana, California and than back to Collins Radio when Hallicrafters closed their "Pacific Division' operation. 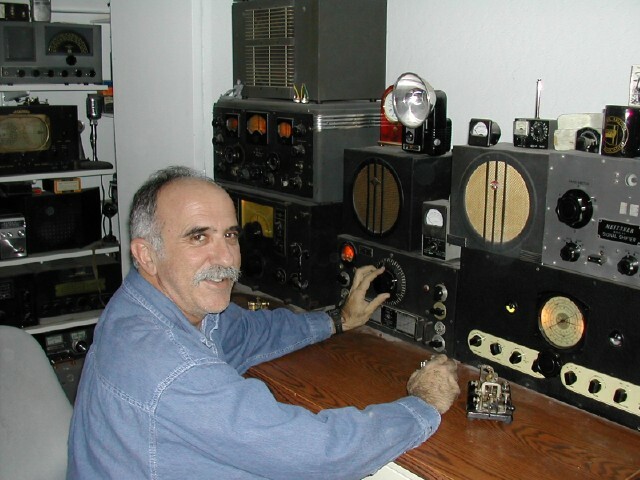 He was never involved with Ham Radio gear while working at either company. 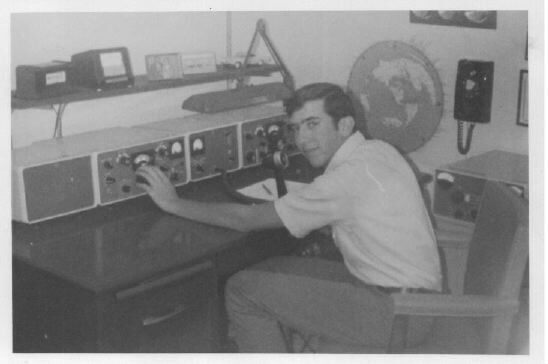 In 1967- 1969, I was also a member of the Collins Radio Explorer Post which was based at the Collins Radio plant in Newport Beach, California. I remember we had a very nice S-Line station in a trailer provided to us and a Collins Log periodic antenna. That plant is still there as Connexant I believe there but a bit hard to see these days as it is now dwarfed by tall buildings. It is located across from John Wayne Airport in Orange County, California. This is WB6NRK around 1970. I was in my first year of college. This is WB6NRK/7 and friends around 1977. From left to right, WB6NRK, Sandy, Mouth, Katsumoto and Buckwheat. My furry friends are all silent keys. Katsumoto's legacy still lives on in my shack. I still find coax cables with his teeth marks on them. I became N7RK that same year. Equipment was a Signal One CX-7A and a Henry 2K Ultra. 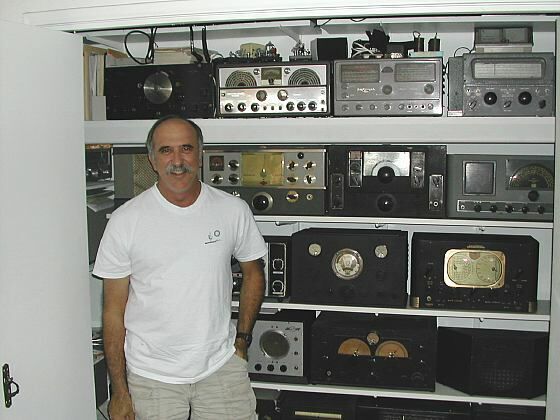 Behind me is an old Motorola AN/GRR-5 receiver which my cousin gave me in 1964 and a home brew 160 meter transverter that I built in 1975 and used with a Swan 270. I sold the AN/GRR-5 in the late 1970's to a military collector here in Phoenix. I ran into him two years ago nearly thirty years later and he still had it. It returned to my shack a couple of years ago still sporting the Beatle's Yellow Submarine decals I had put on it when I was a kid. I thanked him for taking great care of it for the 28 years he had it as it returned in beautiful condition complete with all of the accessories I had sold with it. I did pay more than I sold it to him for :-). I won the Signal One when I was 19 years old. It had been the grand prize at the Fresno DX Convention which is now the Visalia DX Convention in Visalia, California. In 1979, some burglars broke into my house and decided that they liked the CX-7A also and that was the last I ever saw of it. My antenna was a 66 foot vertical which I used on 160, 80 and 40 meters. I wrote this antenna up as an article and it was published in the April 1979 issue of QST . The title was "A Big Signal from a Small Lot". It was recently published again in 1995 in the ARRL publication, "Vertical Antenna Classics". 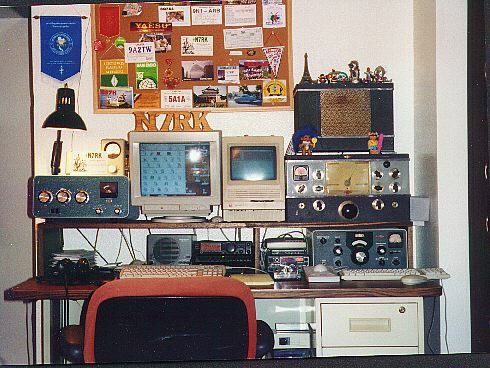 This was the setup that I had used for two and a half years while living in an apartment from 1995-1998. With this setup and a hidden 1/4 wave sloper for 80 meters I worked 235 countries and 40 zones with over 100 countries on 80, 40, 30 and 20 meters. For 2 meter packet, I had a rollup "J" attached to the wall on the balcony. No pictures yet of my present station. A better shot and description of that station is shown below. 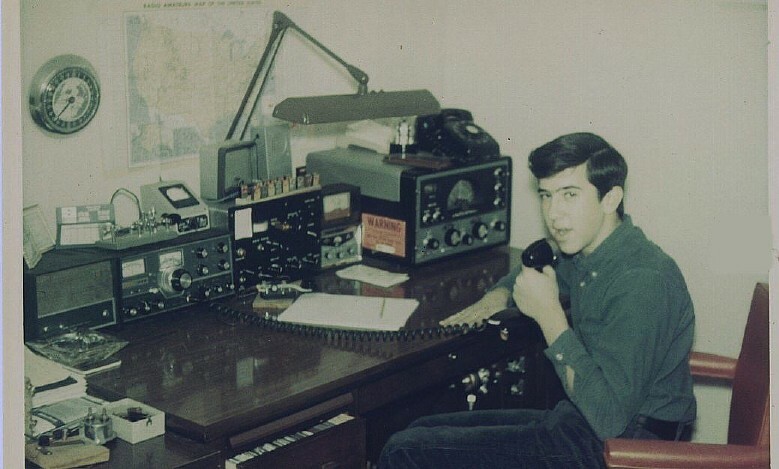 This station consisted of a Yaesu FT-900 driving a Heathkit SB-200 running about 400 watts. This was my main station. 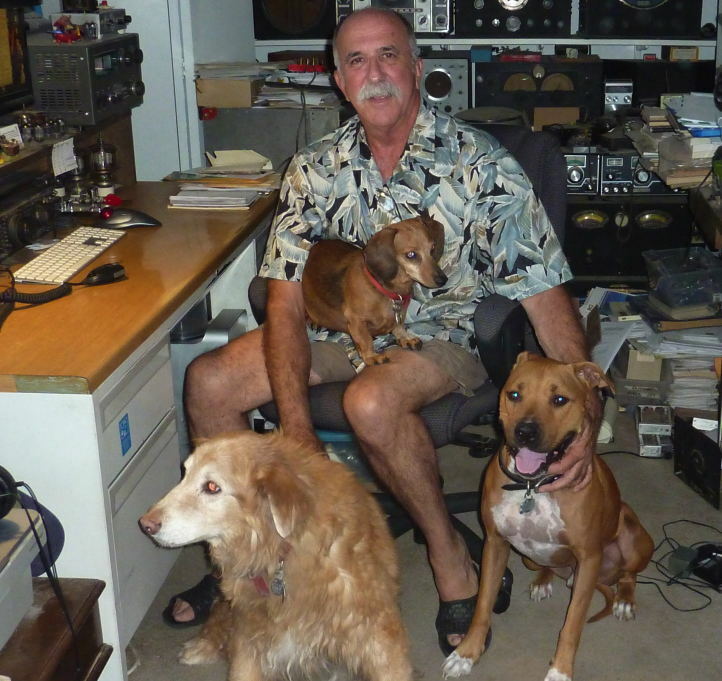 I also had two of my favorite boatanchors to listen to short wave with. They are a 1940 National NC-200 and matching speaker and an early Collins 51S-1 (serial# 5). Also shown is my packet station which consists of an old Kenwood TR-9000 with a Kantronics KAM and a Macintosh SE-30. The main computer is a Motorola Starmax Macintosh. I wrote up the whole apartment antenna and operating experience and you read about on this web page. Here is a recent shot with some of my boatanchors. Here I am with my three dogs, Mindy an almost 16 year old Golden Retriever Mix, Peanut, a totally blind 10 year old Dachshund and CJ, a 5 year old pit bull. I am still chasing DX and still playing with boatanchors. Have been on the DXCC Honor Roll for many years now but still need North Korea to have them all! The fellow who helped me get my first license was Shelley Trotter, W6BAM who has been licensed since 1926. Shelley became a silent key in 2001 at 97. Shelley was a CW only ham and the only microphones in his shack were for a tape recorder and the telephone. Copyright © 1997-2014 by David S. Hollander N7RK. that they are credited to David S. Hollander.